Suppose a celebrated sports coach has faith in the potential of an aspiring sports player. If that player lacks confidence, seeing the coach’s confidence in him will give him confidence in himself. This principle applies to our spiritual growth too. We may doubt whether we can fight against our impurities consistently and eventually become free from them. Significantly however, we can gain confidence by shifting our vision from ourselves to Krishna. 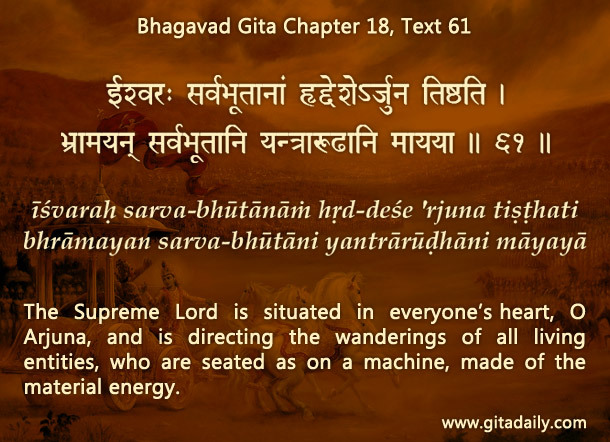 He is our omni-benevolent Lord, and he constantly accompanies us in our hearts during our journey through material existence (Bhagavad-gita 18.61). From that strategic vantage point, he guides us towards spiritual growth. He has been there for many lifetimes even though we haven’t turned towards him. Why would he keep trying to guide us if he didn’t have faith in our potential? Reciprocating with his faith, we need to repose faith in his potency. Even if our conditionings seem overpowering, their power pales in comparison to his supreme power. He is the ultimate coach who can inspire, train and empower us to attain impossible-seeking heights of purity and spirituality. With faith in his potency, we can surrender to him, striving to serve him to the best of our capacity. And by such surrender, we attain the supreme peace and the supreme destination (18.62). Indeed, if we surrender to him, he frees us from all obstacles (18.66). Through his assurance, Krishna urges us to have faith in his potency. If he did not have faith in our potential, he wouldn’t have spoken the Bhagavad-gita, he wouldn’t have so fervently urged us to surrender to him, he wouldn’t even have been present in our heart. When we repose our faith in his potency, we will discover that his faith in our potential is justified and transformational and liberating. How is Krishna like our coach? How is Krishna’s faith in our potential seen? How can we repose our faith in Krishna’s potency? May Krishna continue to bless you with the same kind if wisdom.